With a little break from the popular Woman Crush Wednesday series (due to YDP’s participation last week in the Great Blogger Cookie Swap) we are back with passion! This is the day we honor one of the wonderful women from the culinary world. And who is getting crushed on today? 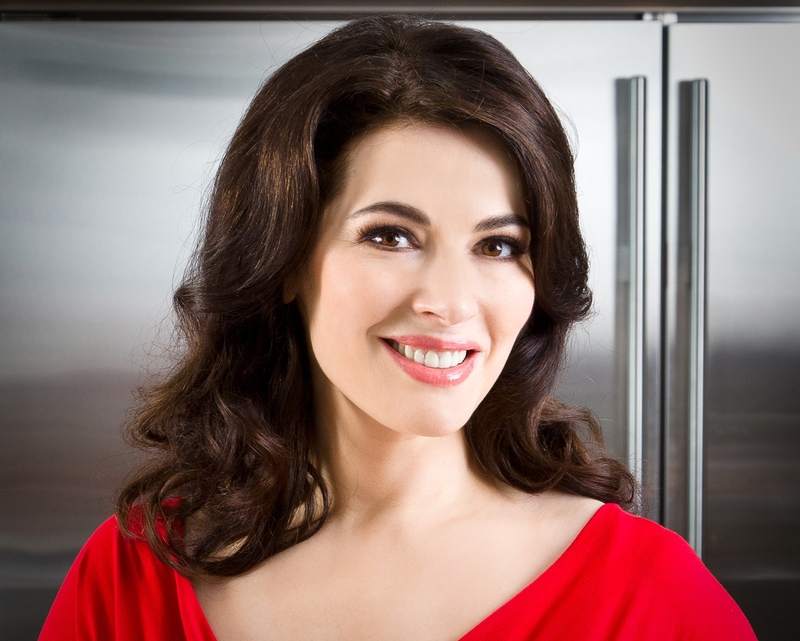 Well, we are infatuated with one of the U.K.’s most recognizable foodies, none other than the amazing Nigella Lawson! For the first time, this week readers and snapchat followers joined in with their suggestions to help choose which cook should get the Yankee Doodle Paddy Spotlight of LOVE. 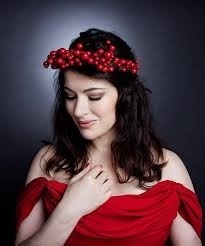 And with Christmas just a couple days away, Nigella has been chosen to get all sorts of fondness showered on her today! 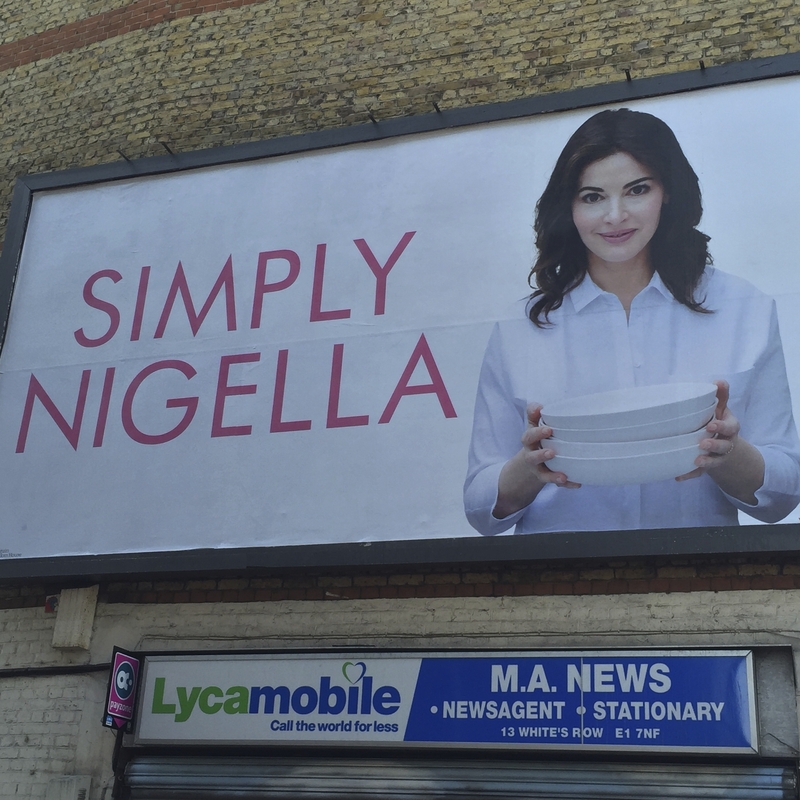 Nigella‘s new book, Simply Nigella seems to be on everyone’s Christmas list. It is called the “Feel Good Food” book and pretty much anything she makes will leave you feeling good! She already has nine best selling cookbooks to her credit, numerous television series under her belt, a popular app, and umpteen awards such as the 2014 Observer’s Readers’ Award as Best Food Personality, just to mention a few of her phenom accomplishments. She really is a Domestic Goddess (as was the title of one of her books) and has been a ‘go to’ for many looking to up their kitchen game. She has made cooking and eating an unabashedly beautiful art form. And all of this from someone who doesn’t even like to be called a chef. 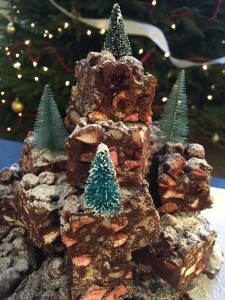 So I am going to create some light with her amazing Christmas Rocky Road recipe. It is currently being featured on her website as a “Cookalong Competition” whereby you make one of the suggested monthly recipes and upload a photo for a chance to win a signed cookbook. 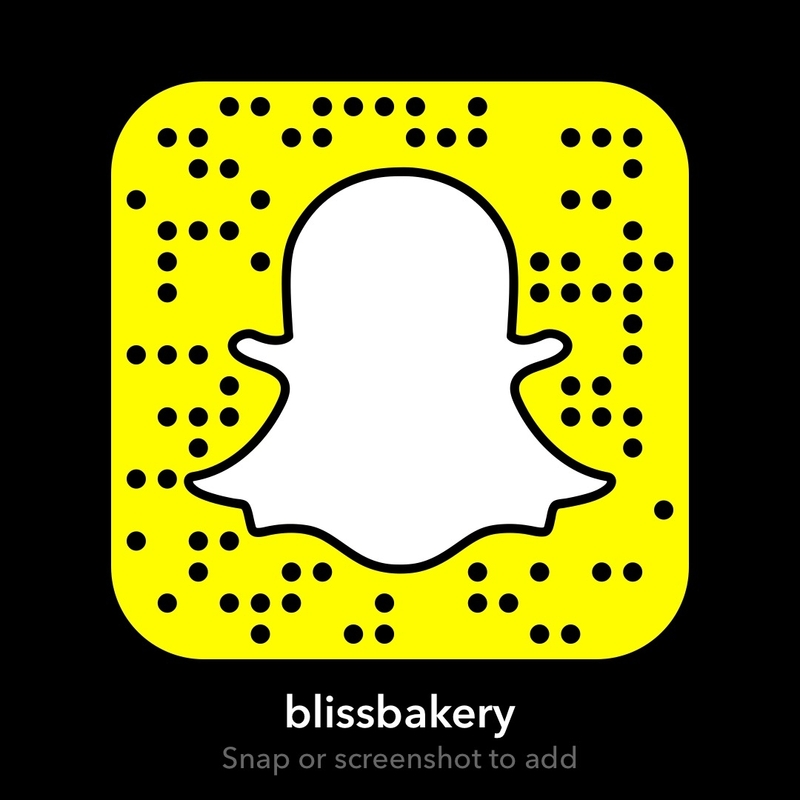 And I will be doing it live on snapchat (username: blissbakery) if you’d like to follow along. It will be viewable for 24 hours until it disappears, but I would urge you all to give this delicious recipe a try yourself and enter the contest. Because what Nigella has nurtured is a wonderful sense of community both on her website and her social media. She includes a regular “#follow of the day” on her Instagram that certainly gives those chosen a massive boost. I’m not just talking about more followers to their account, it is the overwhelming sense of joy that someone as wonderful as Nigella Lawson would lend her seal of approval. Chop both sorts of chocolate small, or use chocolate buttons made for melting, and then put into a heavy-based pan to melt with the butter and syrup over a gentle heat. Put the biscuits into a freezer bag and bash them with a rolling pin to get big- and little-sized crumbs; you want some pieces to crunch and some sandy rubble. Put the Brazil nuts into another freezer bag and also bash them so you get different-sized nut rubble. 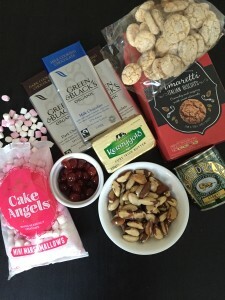 Take the pan off the heat, and add the crushed biscuits and nuts, whole glacé cherries and mini-marshmallows. Turn carefully to coat everything with syrupy chocolate. Tip into a foil tray (I use one 236mm x 296mm / 9¼ x 12 inches), smoothing the top as best you can, although it will look bumpy. Refrigerate until firm enough to cut, which will take about 1½–2 hours. Then take the set block of rocky road out of the foil tray ready to cut. Push the icing sugar through a small sieve to dust the top of the Rocky Road. Then, if you like, add a sprinkling of edible glitter for some festive sparkle. With the long side in front of you, cut into it 6 slices down and 4 across, so that you have 24 almost-squares. Make the Rocky Road and refrigerate to set. Don’t add the icing sugar yet, but cut into bars, then store in an airtight container in a cool place for up to 1 week. Decorate with icing sugar and edible glitter about 1–2 hours before serving. Make the Rocky Road as above and freeze for up to 1 month. Thaw overnight in a cool place. Decorate as above. Though I’m not a professional photographer, these bars are so gorgeous even I can make them look pretty! Perfectly festive treats to give as gifts or take to holiday parties! I don’t normally put in two pics of the final product, but I couldn’t resist a close up shot. 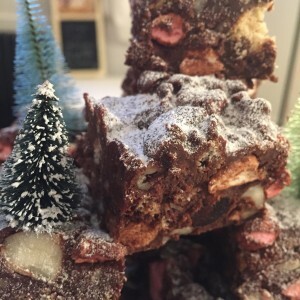 I love all the colors and textures in these Christmas Rocky Road Bars! I didn’t have edible glitter on hand, so I just put a few mini Christmas trees I had to make it look wintery. One of the things I love most about Nigella is her willingness to offer help and suggest tips for finding success in the kitchen. For me, one of my kitchen challenges has been the transition from America to this side of the pond where everything is in metric! It would do your head in trying to sort out all the conversions. But she effortlessly (as with everything) has both versions available with the click of a button. Thanks Nigella! Being a mom of two kids myself, I know how important the holiday time is for family. I just want to take this opportunity to wish you Nigella a most wonderful Christmas and send lots of love and light your way. I also want to thank you for being an inspiration in more ways than one. There are so many of us out there that appreciate the passion and respect you have for food and cooking. And your humility about your influence in the culinary world is as beautiful as you are! But trust me, when loads of your fans eagerly tear off the wrapping paper on Christmas morn to find they have received your cookbook, you’ll likely hear the sound of many ovens being fired up! Cuz there will be a whole lotta Nigella’s recipes on the go! P.S. True story, it was destiny that Nigella would be today’s #WCW because besides the help from the snapchat followers, my friend (who also made our moving announcements) the awesome Holly Shortall and her BFF Jamie Tuohy met Nigella in Dublin not long ago! As well when I was on one of my Foodie Fieldtrip Friday’s recently, I spotted a giant billboard ad for her book and I had to take a picture. So it is a lovefest that has been marinating!